Salvation And Survival: You Know Jesus As Your Savior ... Do You Know Him As Adonai? You Know Jesus As Your Savior ... Do You Know Him As Adonai? Christians are able to identify Jesus as their Savior because [they will tell you], He died for their sins. I'm not sure they all recognize the enormity of that statement, or the concept that because of the Divine Nature of God, and who He is, we all deserve damnation and death for sinning against our Holy God (Romans 1:32 and 3:23). Therefore, Jesus "dying" for our sins means He took the punishment of all God's Creation who rejected Him. That is a debt we can never repay, either independently or corporately. And the New Testament gives us a very clear picture of Jesus as our Savior in Acts 5:31, God exalted Him to His right hand as Prince and Savior and Deliverer, in order to grant repentance to Israel, and [to grant] forgiveness of sins. This grace through faith is also extended to us because we are grafted in as God's sanctified people. But Jesus is worthy of an additional title, if you will, as expressed in Luke 2:11, For unto you is born this day in the city of David a Savior, who is Christ the Lord. It is common for Christians to refer to Jesus as their Lord. But there is a more accurate description of who He is in the Hebrew ... Adonai. The title Lord for Jesus comes from the Greek Kurios, a translation of Adonai. And this word "Adonai" means Lord, Master, Owner. It is also important to see that Jesus's name in Hebrew, Yeshua Ha-Mashiach (Jesus Chist) is YHWH "come in the flesh". So, to say that Jesus Christ is Lord is to declare that He is YHWH (Adonai), Himself. 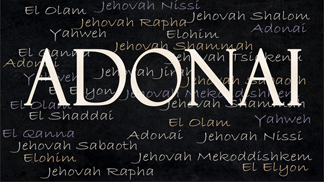 But Adonai is more than a name or a title. It essentially speaks of the relationship we have with YHWH. It is God's total possession of my life through my submission (surrender) to Him. We get a good picture of this in the Bible with the relationship between Abram and God. In Genesis 14, God has delivered Abram through the War of the Kings and he (Abram) announces to the King of Sodom that it is El Elyon (the God Most High) who has given him the victory. It is then in Genesis 15:2, that the name Adonai first appears. Abram addressed God as Adonai or Master, understanding that the Master has the right of possession, and the one possessed is charged with submission to God, his Master. The Bible affirms this in Genesis 15:6, Then Abram believed in (affirmed, trusted in, relied on, remained steadfast to) the Lord (Adonai); and He counted (credited) it to him as righteousness (doing right in regard to God and man). Abram understood this Master/servant relationship. He knew that the Servant depended on the Master to be faithful in provision, protection, and direction (guidance). We can see this concept reflected in the New Testament with the idea of believers as bondservants. This is a reflection of Jesus as Lord or Master. But I have a question ... Do we in the 21st Century still walk in that identity? Do we acknowledge that Jesus is our Lord and Master and Owner? The Biblical relationship that "Adonai" signifies means that Jesus has mastership and ownership over us; and it indicates that God is the owner of each member of the human family, which gives Him the authority to claim the unrestricted obedience of us all. Unfortunately, our American history has stained this idea of a master/slave relationship. But human history need not sully the spiritual portrayal of God's relationship to us as Adonai. From a Biblical perspective, Pastor Kenneth Hemphill explains it best: "The relationship of slave and master in the Bible was more often one of love and allegiance. In the Jewish relationship, a slave had more privileges than the hired help. A slave could participate in the Temple sacrifices and was a member of the household. The hired help was excluded from these privileges. The servant is assured that his Master has the resources and ability to care for him. As a member of the master’s household, the master provides for all the servant needs. The servant need not worry about his basic provision. The servant is assured that help and resources are available for him to carry out his duties as a servant. The master provides what is needed, not only for basic needs, but also for the fulfillment of the tasks assigned to the servant. The servant has the privilege of calling upon his relationship with the Master to get the help he needs. Access to the Master is guaranteed, and is only a prayer away". To some, it may seem that this look at Jesus as Adonai is simply a mundane word study, but I believe the acknowledgement of this concept of Jesus as our Lord, Master, and Owner has great implications for the Body of Christ today. For far too long, the Church has allowed the culture to dismantle the identity of Christ. As I stated in a previous post, I am concerned that we no longer fear God. And I see Jesus relegated to an equal with other gods, while the Holy Spirit has largely left the Western Church. Sadly, too many Christians don't read their Bible with any hunger to know the Father or the Son. And if you don't know Them, how can you have a relationship with Them, let alone in the proper perspective? I want to see and know and declare Adonai as Abram did! And it starts today! Yes, Jesus is my Savior, and I know the eternal gift of salvation that He has afforded me! But I also know Him as Adonai -- my Lord ... my Master ... and He owns me! I acknowledge that I am His servant. And I acknowledge that, as Adonai, Jesus is Owner of all, and we are all stewards who have been declared worthy by Him to serve -- and we all count it a privilege to serve. I understand and declare that as Adonai, Jesus is my Master and can supply all my needs, including supernatural empowerment enabling me to serve God. And, finally, I recognize that I can do anything and all that Jesus, as Adonai, commands me to do. There is no doubt or fear or unbelief in His authority and power -- or mine to carry out His commands! Yes, I know Jesus as my Savior, and I truly honor His sacrifice and the gift of eternal life that is mine. But I never want to diminish His role as Adonai; as my Lord and Master. Nor do I want to refuse the challenge to live my life as a demonstration of His Lordship in it. On that day when I stand before Him, and say, "Lord, Lord", I want Him to smile and say my name, acknowledging that He has known me. And I will cry out, as King David did, "You are my Adonai. I have no good besides You." Thanks to the website, Precept Austin, for their references on the meaning and concept of Adonai. Matthew 1:23 the angel said they shall call his name Em-Man-Uel, being interpreted is, God with us.